Building New Standard Gauge/O Gauge Layout - Track Choices etc. I recently moved to Davie county NC (west of Winston Salem) and am ready to start my new tinplate layout. 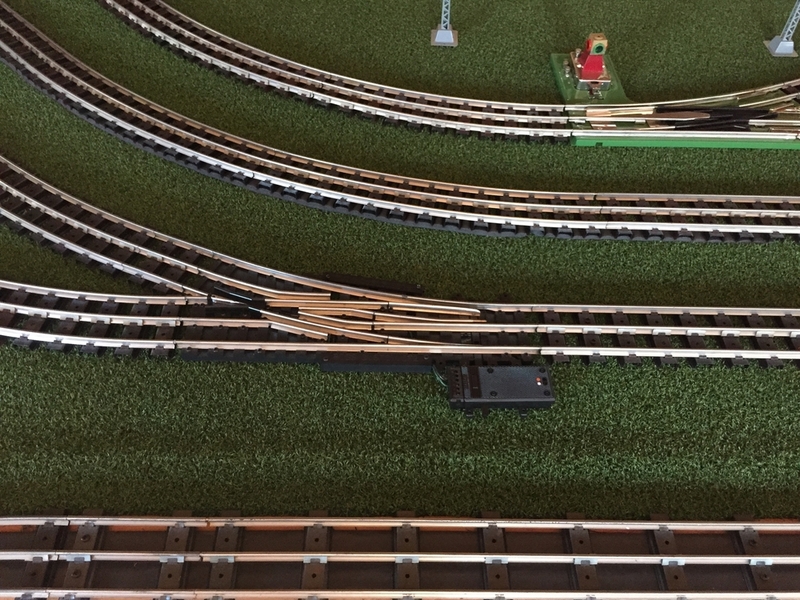 My last layout consisted of two loops on a shelf around a 19' x 12' room, one standard gauge loop and one 0-27 loop with marx 34" curves. My new space is larger and oddly shaped. Pictures and measurements of the new space are shown. I will start with a shelf around the space at 31" for good viewing when seated. I may add a smaller upper shelf. I have a LOT of USA standard gauge long straight track pieces, so I will probably use tinplate track for standard gauge. Not sure about O gauge track. I want the track to be as quiet as possible, so I need advice on roadbed, homasote and other alternatives. Advice on track layout would be welcomed also. I am thinking of semi-realistic scenery with a combination of tinplate and scale structures, and HO sized structures for forced perspective. Bridges, mountains and tunnels will present. Good choice on USA Track for the SG. For SG switches, you can't go wrong with the ones made by Ross Custom Switches. They're more expensive than other brands, but when it comes to performance and quality, no other brand comes close. Homasote makes a great sound deadener/roadbed. Great space. Keep us posted with photos. USA all the way. I used std 72 and bought Std84 to make o84 radius on outside rails. Kirk at USA is top notch!! I recommend you consider using Std87 curved track instead of Std84 if you have the space and are planning to run an adjacent Std72 curved track. Thanks for the good advice! I read some posts about SGMA's module specs and was thinking about two standard gauge loops using Std72 and Std42 curves. The idea behind these two curve sizes would be to provide adequate spacing while keeping the tracks somewhat close to the room walls. I guess that Std57 is too small for a parallel track using Std42 curves. I hear universally good things about Ross switches, but they are a bit expensive. Do the MTH tinplate switches work with most modern tinplate, or are there derailment problems? I am strongly considering flexxbed instead of homasote. Then there is the question about O gauge track for tinplate - thinking about gargraves and/or tinplate. The O gauge track might run slightly above and behind the standard gauge track, but closer to the walls of the room. Once the carpet is installed, I will begin some sort of shelf/table. I may just have to start and see where it goes. Yes, MTH switches work with most modern tinplate but not all. Even the tinplate that works routinely has a rough ride going through an MTH switch. In fact, I am so tired of the derailments caused by MTH switches on my passenger station modules that I am currently in the process of replacing all the MTH switches on those modules with Ross. Fortunately, the footprint of Ross switches is the same as the footprint for MTH switches so they can almost drop right in. However, unlike MTH switches, which can operate on track power, Ross switches can't and require a different power source. 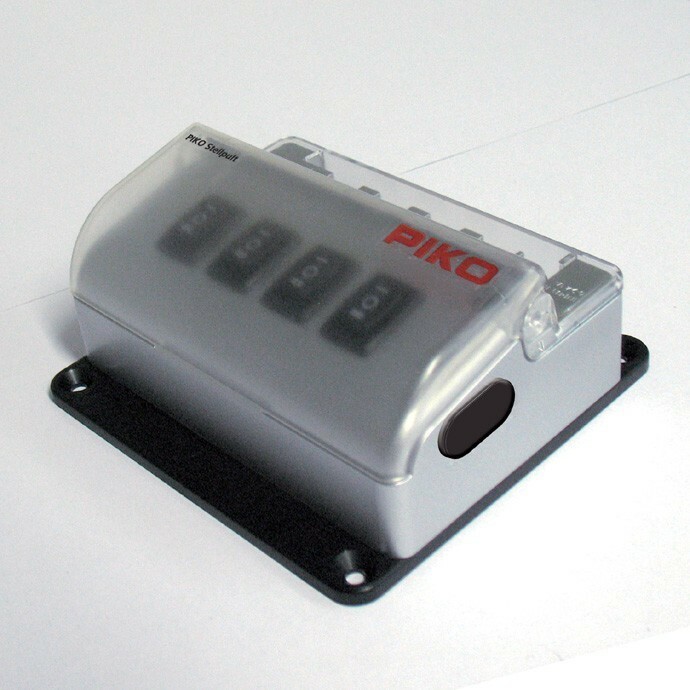 Fortunately, there is a solution, i.e., the PIKO switch control box, which converts either an AC or DC power input into the exact electrical power output needed to operate the LGB switch motors that are standard on Ross Standard Gauge switches. Ross Standard Gauge switches are expensive but in SGMA's experience their trouble-free operation is worth the extra cost. Furthermore, Ross switches have several design features which MTH switches don't. For example, the switch motor can be mounted on either side of the switch and they have a low profile, which virtually eliminates the train/switch contact problem inherent in the high profile design of MTH switches. Also, if you install your mainlines with 7.5" spacing, the small footprint of Ross switches permits their use to move trains between mainlines. The large footprint of MTH switches prevents their use in similar situations. I currently have MTH switches on my modules but am in the process of removing them and replacing them with Ross switches. I recommend you use Ross switches on your layout particularly in locations where access to the switch is difficult, i.e., a location where derailments are more likely to occur. Homasote is a good sound-deadener, but it is messy to cut and it really soaks up paint. Low pile indoor/outdoor carpeting is an alternative, but it does not lend itself to being a base for scenery. Before you go all-in on homasote, it might be beneficial if you can visit with someone who has used it. Also, I'm not sure how it will fare in a humid environment. To address your question about O Gauge, it's tough to beat Lionel tubular sectional track, or even its equivalent from Menards. You have a lot more choices with O Gauge than standard gauge, especially for switches. If you're running tinplate, try to find the K Line Super Snap or O Line Reproductions switches. Just about everything, from the oldest tinplate to modern trains, will run right through them, even the prewar wheels with deep flanges. No offense, I contacted Kirk at USA prior to my purchase. He said the most concentric radius was the std 72 and 84 track. I have been running my 400e on the inside 72, and my largest premier and tinplate O on the outside 84 with no issues. I will not be using any switches. I like the idea of Ross switches in important areas and MTH or Lionel switches where derailments are not a big issue. Since my room is not a rectangle, I don't need exactly concentric track, but it would be desirable in some spots. I think the largest overhang would be from my 392e or my MTH/Ives 3245 (the big Olympian electric). The largest underhang would be the president's special AF cars which are the same size as the AF/Ives Olympian passenger cars. These probably need 7.5" spacing based on posts in this forum discussing SGMA spacing. I will look into the tubular O track, thanks for the suggestion. On my last layout, I had one loop for O tinplate inside the SG loop. I used O-27 track with Marx O-27 curves that were about 34". It worked fine with all my tinplate, but I did not have any switches. Will tinplate engines such as the 263 work with O-27 switches - I'm guessing not. The 263 engine worked (just barely) on O-27 curves, but my Blue Streak train did not. I am not sure what Kirk meant by "concentric radius", but I am surprised that Kirk said that since he was the initial advocate for moving the outside mainline further out based on contact problems he and other members had witnessed at some of our earliest train shows. 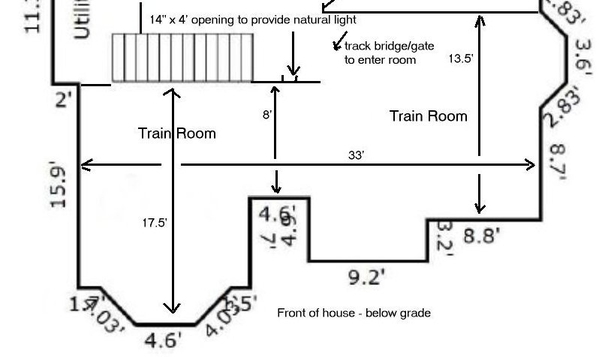 At that time std87 track did not exist and rather than simply pulling a radius out of a hat, SGMA members put in a herculean effort to measure and document the overhang and underhang of as many SG trains as we could find to determine what would be the optimum radius for our outside mainline. Ideally we wanted to eliminate all contact problems between SG trains on SGMA's corner modules. However, from the start members knew that eliminating all contact would be unrealistic. Also, whatever became the standard had to work within the physical dimensions of our 4' X 4' corner modules. As such, std87 track was realistically the largest radius that would work but even it does not eliminate all contact. However, it does significantly reduce it. In addition, Kirk noted that std42, std57, std72, and std87 track produced evenly spaced mainlines, which is ideal if you want Ross to design switches that allow trains to move from one mainline to another such as the Ross #4 Standard Gauge switch. Lastly, Kirk owned the tooling to produce any radius of Standard Gauge track that club members determined was optimum. So as a club we weren't limited to std84 track, which was at that time the only commercial track existing larger than std72. In your situation, contact between your trains on std72 and std84 tracks may not be a problem. However, at shows SGMA members bring in and run all manner of SG trains from 100 year old rarities to the latest MTH (Lionel Corp) locos. 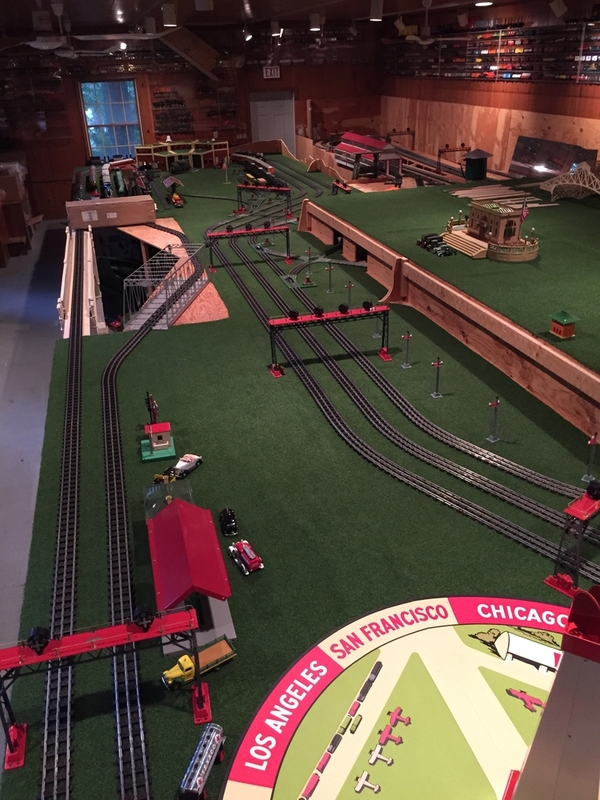 Furthermore, it's been a SGMA tradition from the start to open up our train show layouts to anyone who wants to run their Standard Gauge trains on the SGMA layout. As such, SGMA needs to err on the side of caution so as not to endanger somebody's prized 100-year-old family heirloom. Lastly, at the start, when SGMA members were developing our initial module standards, installation of any switch on our then std84 mainline was prohibited. We knew MTH switches were problematic and wanted to have at least one mainline where derailments and contact between trains would not be a problem. It was only after SGMA members worked with Ross to develop a problem free switch that installation of Ross switches, and only Ross switches, was permitted on SGMA's outside mainline. This became a SGMA module standard. I started building the shelf benchwork on Wednesday. I got a good bit accomplished, now I have to do some planning. The white 1 x 4s and legs are temporary. My goal is to have no legs on the floor. I am not fond of planning, so my strategy is: build, plan the next step, build some more and so on. There is a lot of space, it is a little overwhelming - but that is a good problem to have. Benchwork is somewhere between 1/2 and 2/3 done after only eight days! Seven sheets of OSB on my tiny trailer made for an interesting drive home from the local lumber company - 40 mph tops since the center of gravity was so far back. I like the MTH repro green colored ( classic look for me) standard gauge switches. In either 042 or 072. Ross makes a great switch too, I just like the classic look and in new condition. I agree, the tinplate look is priceless, but I got over wanting that look real fast when I saw how well the Ross SG switches work. Performance is virtually flawless. As our friend the late Arno Baars said about the Ross switches, "You can always paint them." Today's update: basic benchwork complete in slightly less than two weeks! Ready for installation of padding. I need to build the room entrance bridge about now also. Progress will slow down a bit at this point due to other things on the schedule. Looking good! I definitely plan to make my next layout an “around the walls” design rather than an “island”. 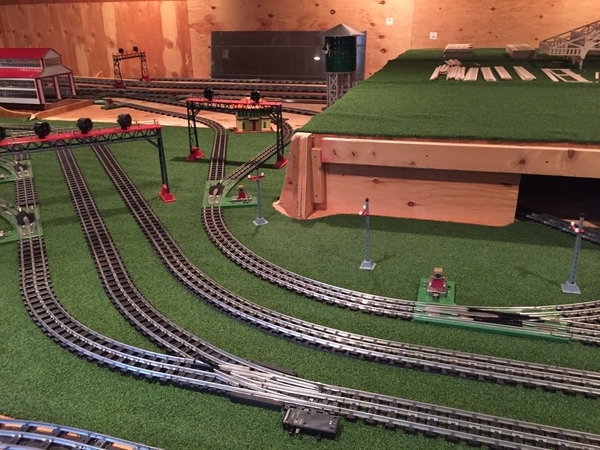 Just to clarify, the USA Track LLC standard gauge track we manufacture here in Malvern PA is made in five fixed diameters. The 42,57,72 and 87 are designed to be installed 7-1/4” center-to-center. The 72 to 84 center-to-center is only 6-3/16” , adequate for most vintage standard gauge, but not for some modern era standard gauge cars and locomotives. The Standard Gauge Module Association (SGMA) uses 7-1/4” track spacing, and the Ross standard gauge #4 track switches (designed in collaboration with the SGMA) make a crossover on 7-1/4” centers when connected as a pair. Thanks for clarifying. I stand corrected. Still enjoying your wonderful track. The best anywhere! I envy those on this forum who have basements, which are not all that common in the South. Wish we had one! Bob Nelson- I thought everybody in Arkansas had an outbuilding! We do, but that's where we keep our chickens, hogs and mules; tuneup our NASCAR hot rods; and brew our white lightening, so there is no room for any trains. Today's update: First train runs all the way around the inner loop! Room entrance bridge complete with IR detectors to shut off power when open. Track wiring for the inner loop is complete, with wiring for the other two loops already in place. 12VDC and 5VDC accessory wiring with busses every 6 ft. in place and in operation around entire layout. The bridge in front of the power station is still under construction, but functional. I used buss type wiring for the track, but divided the hot rail into 6 sections with insulating pins at each section end. DCS signal is 10 all the way around. Not the best pictures, but you get the idea. It has been almost a year since I took the trains down at the last house, but it was well worth the wait. Looks fantastic! Keep the photos coming. Looking great! My previous dread of taking my old layout down has now been replaced with elation at the opportunity to copy your around the walls design! Today's update: Two standard gauge loops in operation, switch machines operating for loop transfer tracks and reversing loop. The outer loop has a half circle around the power station that looks scary when the trains run through it - but even the Olympian stays on the track. Even more scary is the reversing loop which goes in front of the power station. I have tweaked the track and switches, and so far everything goes through it, even when it has to be in reverse. The switches for the reversing loop are modified American Flyer. The warped pot metal manual actuator has been replaced with servo motors controlled by an arduino. All good, except I sometimes get spurious servo operation when I operate the LGB switch machines on my Ross switches. The loop transfer switches and the reversing loop allow for interesting operation! I got the spurious servo problem fixed with help from people on the electrical forum. I am gluing down the track and removing the temporary screws. it is very quiet! Now I have to figure out where the O scale loop goes - it will be nearest the wall. The S curve to the left of the power plant was problematic with my 392e. The tender draw bar cannot tolerate an S curve with a 42 in radius. I fixed the problem by relocating the draw bar post to the trailing wheels under the firebox. I am really enjoying running trains again. Just catching up on this thread - great job - really like the around the wall approach. Giving me some ideas! You may have already done this, but a loop with all 72 diameter curves (or larger) curves is a great part of any layout. Some MESG trains won't run on tighter curves, and everything runs better. Using increasing diameters of curved sections yields parallel tracks, which looks cool. Concentric curves, MTH & Ross switches and standard and extra tie (Super Standard) track all in one photo! Wow, very impressive! That is a large layout. I used a half circle of 72 dia curves on my inner loop with 57 in for the rest. My next loop uses mostly 42 in curves with a few 57 in curves. I needed the sharper curves to accommodate the track placement on the shelf.